B&B Collision – B & B Collision Corp offers a state-of-the-art repair facility and high tech equipment. We have been serving Royal Oak, Michigan since 1977 and we specialize in repairing early to late model vehicles. 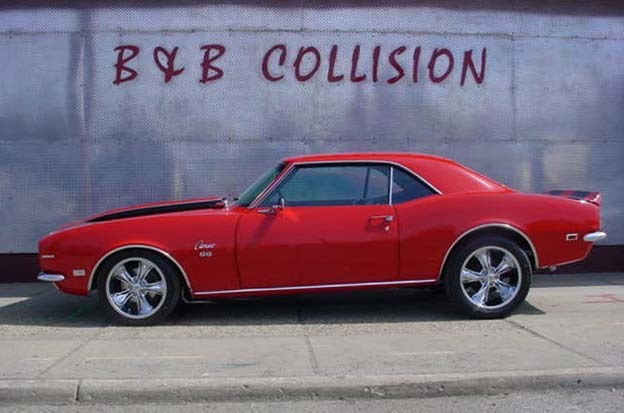 B & B Collision Corp offers a state-of-the-art repair facility and high tech equipment. We are proud of our facilities and our people. We have been serving Royal Oak, Michigan since 1977 and we specialize in repairing early to late model vehicles. B & B Collision Corp employs experienced and capable certified technicians. We are a family owned and operated business. We will treat you as a valued member of our extended family. We have a passion for our work and it shows in our attention to the smallest details. We’re not satisfied until the job is perfect and you’re thrilled with your car. The body repair process starts out with our experienced techs and if needed the car will go on our uni-body frame rack with laser measuring system. After the process is done, our detail techs take over and clean and detail the vehicle for final inspection and delivery. We take pride in our services and even more pride in giving your car back in pre-accident condition. My Husband took his car in to get fixed before his lease was up. Randy and his guys did an excellent job making my husbands car look brand new. They came under the estimate and had his car ready when promised. We will definitely use them again if we have too.. I backed into another car with my brand new vehicle! I was heartbroken, but B & B saved the day! Extremely quick and with excellent results! Fair pricing too! The car looks new again. Highly recommend. I destroyed my front bumper by parking too close to an icy snow bank this past winter. Thankfully I found this place!! I took my car in last month for an estimate and they were very honest and quoted me at a fair price. They had the repair done quickly and did a fantastic job!!! I feel like I’m in a brand new car now!! I was very pleased with the service and the staff was very friendly!! Got a nasty dent and some big scratches, and Randy and his team got the car looking like new in less than 3 days and did so for a fair price. I hope to never need body shop services again, but if I do, I know I will use B&B again. Brought my 2011 Cadillac SRX in because of a few big dents and scrapes. They did a fantastic job and were easy to work with. No pressure sales guys. They gave me a quick quote in less than 5 minutes of me walking in. I priced out a two other places and the others were $100 more expensive. Amazing quality prompt and friendly service I live in Clarkston and it was well worth the drive to have the best make my baby pretty again! This place was awesome. Went to 2 places before b&b to get quotes on getting a bumper reattached. Both quoted me around $900 for a new bumper. Both just looked at the duct tape and said I needed a whole new bumper. HERE IS THE PRAISE. B&B actually got down and looked underneath, listened to me and what I was trying to accomplish and it only was $200. They called and apoligized when I needed 2 additional clips and it was $12 more…no apology needed they saved me $700 and the work was awesome. STAND UP…HONEST SHOP. STOP LOOKING AND GO THERE!!!! I was so pleased with the service at B&B from Nick and the others in the office. Everyone I came in contact with was pleasant, easy to work with, and most importantly respectful. It took about 5 minutes to go over the damages and review a quote. When I called to schedule service, it was about 5 days until I could bring it in. They even gave me a ride from my house when my car was ready, and it was sparkling clean and beautiful when I got it! I would highly recommend taking your vehicle here. I can say from experience they do great work and affordable work. Years ago I was referred to B & B for major repairs on my brand new work van. I’ve since used them for three other repairs on various vehicles and now I’m bringing my daughter’s car in. I guess we’re accident prone. The good news is that I don’t have to think twice – B & B is professional, honest and pre-approved by my insurance company — State Farm. Amazing service, friendly staff and very thorough!! If you need a body shop there is no where else you should go!!! Stopped by for an estimate. 5 minutes later I had a written quote and agreed to have the work done. I thought the quote was very fair. I picked the car up and found the work was excellent. I had a small dent on my door & had my bumper repaired and had the car waxed while it was in.The job was done 100% correctly as promised, I highly recommend B&B to anyone. Thank You B&B and Nick who assisted me. We had an great experience at B and B Collision Corp. I called to find out what the process was for getting a quote and was told it would take 10 minutes. I arrived as soon as the business opened and was back in my car inside of 10 minutes. The business owner treated me with respect and he took time to explain my options. The job was done in the time frame that I was told and it was a really great repair job. He was able to do the job for less that he quoted, which he didn’t have to tell me and could have pocketed the extra money. Instead, he gained a loyal customer. I highly recommend using B and B Collision Corp. Very customer oriented, with excellent service. Nobody wants to visit a collision shop, but when I need to , B&B is my go-to spot . Friendly, helpful and they do great work. I had a wonderful experience with B and B. After an accident that caused a considerable amount of cosmetic damage to my car, I went to B and B for an estimate. Turns out, I had to use a different shop for an estimate for my insurance company, but B and B was still happy to perform the work on my car. Randy was in constant contact with me about the progress, and was relentless with the insurance company to make sure my car was fixed in a VERY timely fashion. The work was fantastic, and they even went the extra mile and did little things like polish my headlights and buff out some other small scratches. I would highly recommend this shop to anyone who needs work done on their car and likes to be kept in the loop about what’s going on. For this family business, it’s all in the details and it’s all about a real appreciation for fine work. 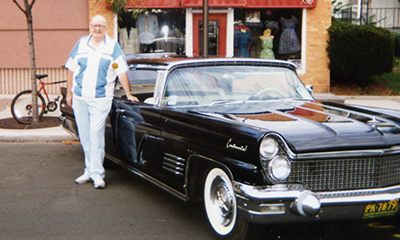 This car, a 1960 Continental Mark V, belonged to Bill Booden. 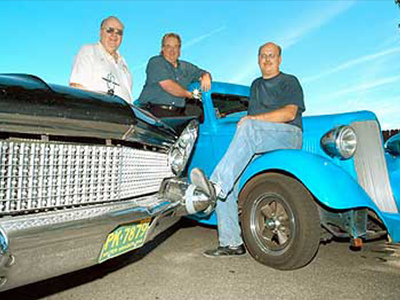 Bill and his son, Randy, are the guys who started B&B Collision 37 years ago. The car? It’s the largest American production automobile ever built; only 1,461 were made. Bumper to bumper, it’s 229 inches long and weighs 5,200 pounds. Nobody at B&B Collision really thinks their job is a headache. It’s clear they get a kick out of taking a car that’s been badly wrinkled in an accident and, by paying careful attention to all the small details and working on it as if it were their own, returning the car to the owner as though the problem had never happened. “We just finished a Taurus for a woman. The car only had 7,000 miles on it – it was new. She was thrilled with the work and said she never would have known it’d been in an accident,” Wendy said. There are pictures everywhere of favorite racing cars. 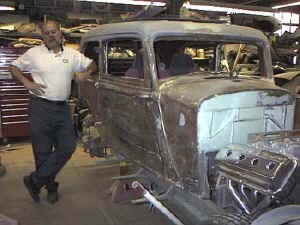 Randy is restoring a 1934 two-door Plymouth sedan from the frame up. “We consider ourselves a full-service collision repair facility. People always have a choice when they get in an accident – take it to the dealer or come to an independent body shop like ours. There are a lot of people who swear by the dealer, but there also just as many people who just don’t want anything to do with the dealer,” Randy says. Wendy points out their techs are state certified – something that wasn’t always a requirement. Their staff keeps up with the latest certifications and works on the principle that every detail counts. In the end, it can all be blamed on Randy Booden’s brother, Wayne. Wayne Booden got Randy hooked on Chryslers when he bought a 1969 GTX. “He was always into Mopar,” says Randy, of B & B Collision in Royal Oak. They used to drag race at Detroit Drag way in 1970, and they used to cruise Woodward. He already went through that with his family once, and once was enough. “In 1981 or ’82, I went looking for a car (to race). I wanted a 1969 GTX. It took me a year to find it.” He raced it before and after marrying his wife. After that, building a family took precedence over building the GTX. Rather than race it, Randy would take the GTX to shows, drive it around the neighborhood, and park it in front of his business. “Then one day I was getting ready to leave for vacation, and it was parked out front (at work), and this guy walked in and offered me a lot of money that I couldn’t refuse,” Randy said. Randy figured since he wasn’t racing the car anymore, and his wife wasn’t driving the car as much as she used to, he wasn’t going to turn down this guy’s offer. So, Randy called his wife and asked her to get the title out because he was going to sell the car. When Randy got back, he knew what he had to do. 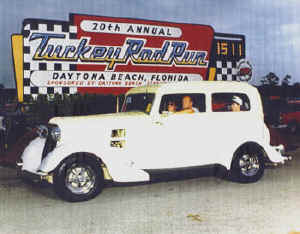 “I knew where this car was,” Randy said, referring to the ’34 Plymouth. “I’d tried to buy it a year and a half before, but the guy didn’t want to sell it.” This time, Randy bought it on the spot. What’s he doing to it? 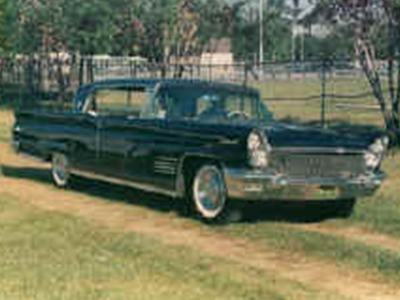 A complete update – new suspension, new rear end, new engine (a 1957 Chrysler Imperial 392 Hemi. Randy went looking for that engine in Indianapolis, and somebody said sure, they knew right where one was – in St. Clair Shores). He’s also doing something to the Plymouth called “slamming.” “That’s the new rage; getting a car as low as possible (to the ground) and still making it functional.” By the time Randy’s done, the Plymouth will sit about 2 inches above the ground. 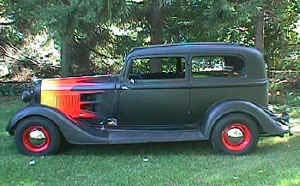 “It’s going to be a muscle/street rod,” Randy says, guessing that it will be on the streets by this summer. “It won’t take the place of the GTX. But it’s going to be close. If you have more specific service-related questions, please contact us at 248-543-2929. We’d love to hear from you. If this is not convenient for you, we invite you to complete the form on our contact page and then we’ll be able to call or email you with the information you’ve requested. We strive to understand and exceed your expectations.